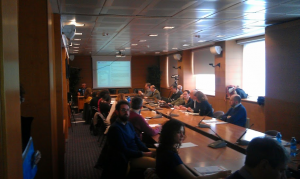 Hosted by ISPRA, the second national workshop to show the LINKVIT platform and to launch the start event of training action was organised on March 4th in Rome. To give the opportunity to attend the event to more people as possible from national and local public Authorities, the workshop has been available also in streaming. It gathered about 40 people in face side event and more than 135 people in simultaneous remote connections; most of the participant was part of national and regional Public Administration technical staff, but the event recorded the attendance of university and research institution people, as well as individually technical people coming from private company or professional offices. The workshop was divided in two sessions: the first concerning the project status and a general overview; it produced the training professional paths and the general contents of modules available in the platform with a specific focus on the Italian version of training offered, beyond the calendar regarding the training action proposed. The second session presented 3 pills of modules extracted by the LINKVIT proposal, using the online material available in the e-learning platform. The responses to this event are quite good and for the first part of training action are attended around 100 trainers.